Apple today updated its most popular iPad with support for Apple Pencil plus even greater performance, starting at $329. The new 9.7-inch iPad and Apple Pencil give users the ability to be even more creative and productive, from sketching ideas and jotting down handwritten notes to marking up screenshots. The new iPad is more versatile and capable than ever, features a large Retina display, the A10 Fusion chip and advanced sensors that help deliver immersive augmented reality, and provides unmatched portability, ease of use and all-day battery life. iPad’s beautiful 9.7-inch Retina display delivers gorgeous detail and vivid colors, and features a higher-resolution touch sensor that enables Apple Pencil support. First introduced for iPad Pro, Apple Pencil has become a popular and versatile tool among students, professionals and creatives and is now available to even more customers. Apple Pencil delivers a remarkably fluid and natural drawing experience. Advanced sensors measure both pressure and tilt, and provide pixel-perfect accuracy and low latency for activities from note taking to illustration in apps like Notability, Pages, Numbers, Keynote and Microsoft Office. iPad’s palm rejection technology even makes it possible to rest your hand on the screen while you use Apple Pencil. The new iPad features the Apple-designed A10 Fusion chip with 64‑bit desktop-class architecture, delivering 40 percent faster CPU and 50 percent faster graphics performance for seamless multitasking and graphics-intensive apps. The front- and rear-facing cameras offer exceptional low-light performance and HD video recording for document scanning, moviemaking and FaceTime calls. The new iPad is a stunning, large viewfinder for immersive AR experiences. Its Retina display, powerful chip, enhanced cameras and advanced sensors, including a gyroscope and accelerometer for accurate motion tracking, are designed to support the next generation of AR apps. Built for durability and mobility, the new 9.7-inch iPad features an aluminum unibody construction and ultrafast wireless that can deliver two times faster cellular data connections, so it is even easier to stay connected anywhere.3 With Apple SIM, customers can connect to wireless data plans right from their device when traveling in more than 180 countries and regions. iOS 11 introduces powerful new features for iPad. The Dock provides quick access to frequently used apps and documents from any screen, and makes it easier to multitask with Split View and Slide Over. Drag and Drop makes moving images, text and files between apps easier than ever. Apple Pencil is more deeply integrated into iPad with support for inline drawing. The Files app provides a central place to access and organize files no matter where they are located — on iPad or in the cloud with built-in support for iCloud Drive and providers like Box, Dropbox and others. • iPad comes in silver, space gray and a new gold finish and starts at an Apple retail price of $329 (US) for the 32GB with Wi-Fi model and $459 (US) for the 32GB Wi-Fi + Cellular model at apple.com and Apple Stores. It is also available through Apple Authorized Resellers and select carriers (prices may vary). For more information, please visit apple.com/ipad. • Apple Pencil is available for purchase separately for $99 (US). • Schools can purchase iPad starting at $299 (US) and Apple Pencil for $89 (US). • iPad is available to order today and starts delivering to customers and arriving in stores later this week in more than 25 countries and regions: Australia, Austria, Belgium, Canada, China, Czech Republic, Denmark, Finland, France, Germany, Hong Kong, Hungary, Ireland, Italy, Japan, Luxembourg, Netherlands, New Zealand, Norway, Poland, Portugal, Singapore, Spain, Sweden, Switzerland, UAE, the UK and the US. India, Russia, Thailand, Turkey and other countries and regions will follow in April, with South Korea and other countries and regions following in May. • Smart Covers for iPad are available for $39 (US) in charcoal gray, midnight blue, (RED), white and pink sand at apple.com and Apple Stores. 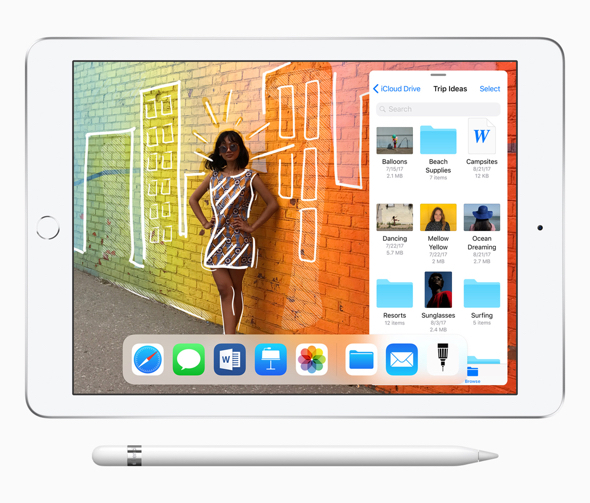 • Every customer who buys iPad from Apple will be offered free Personal Setup, in-store or online, to help them set up email and iMessage, download apps from the App Store and more. • Anyone who wants to start with the basics or go further with their new iPad can sign up for free Today at Apple sessions at apple.com/today. This is awesome, MDN snorers notwithstanding. Until today, the cheapest Apple-Pencil-compatible iPad was the 10.5″ iPad Pro, at $649. With this announcement, the price of Pencil support plummets to $399, or $299 for schools. If you don’t need an Apple Pencil or you think students should pay more, then snore away. But for the rest of us, this is a solid announcement. Developers of apps that support Pencil, like Duet Display ($40 plus $20 per year) and Air Display ($10), must be giddy about this. This is as expensive as a Chromebook. It is just another Apple attempt to push iCloud rental. Snore is correct. Until Apple delivers affordable desktop eMacs again, and tough ~$500 MacBooks, this isn’t going to do anything to stem Apple’s decline in education. The Mac is the platform to use, not iOS. Are you kidding I don’t care about education (with respect to iPads that is!) or Pencils but 329 for an A10 based iPad is freaking awesome. Apple doesn’t care about education either, obviously. Since you’re not in school or an educator, then Apple will happily take $428 plus tax for your new 32GB iPad and pencil. Not including the many accessories needed to make it halfway as usable as a Mac. Chromebooks are far less than the price you quote. Apple is not willing to give up margin for volume- even in the education space. $99 is a joke for the Apple Pencil. It is not that special. You do realize that the iPad has a keyboard built in – Don’t you? Chromebooks are a piece of crap. crap, but price has a huuuuge entry influence in the Edu market. If this tide isn’t stemmed soon, this will be like the many year battle with MS in the Edu market, where Apple lost. School systems will pay a bit more (sometimes), but by in large, pricing needs to be on target and I believe Apple is missing it here. If I can’t touch-type on it, it’s not a keyboard. It might be a pretty, touch-sensitive PICTURE of a keyboard, but it’s not a keyboard. Maybe if you are writing long papers or novels – most of what kids are doing is creating presentations, videos etc which don’t require much typing so touch-type (old tech) in not relevant anymore. Apple did mention a $49 Crayon, that pretty much does what the Pencil does. I’m not sure if that’s for education only, or if anyone can buy it as they can for this iPad, possibly at a slightly higher price. I am disappointed that they didn’t lower the price somewhat. It was exciting to think that the reports of a $259 version would be coming. They should have kept the previous model in the line, and lowered the price, while coming out with this one. Apple really does need to do something more to increase iPad buying, as the increase we’ve seen lately seems to have petered out, with just a 1% growth. I know that there were 13 buying weeks in the holiday period this year when compared to last, but still, Apple needs to get this moving at a decent yearly rate. Getting it into more hands around the world is important. • Apple Pencil – ($99). • Compatible sized sleeve – (10.5″ is the closest size currently in the Store). • Compatible sized keyboard – (I have no idea why they picture the 9.7″ with a cover/keyboard on their sell page, because there ain’t none to buy! You might as well get the $99 Bluetooth Magic Keyboard or $60 Belkin Wired Keyboard). Currently on the Apple refurb store: a Mac Mini for $420. Stretch a bit and you could graduate to a much higher level of computing. It’s a regular 9.7” sleeve. I see them in the Apple stores here in NYC. The keyboard cover will be produced by Logitech. I don’t know if Apple will produce their own. But the product was just announced. Give it a few weeks. Thank you! Since the Logitech keyboard cover isn’t available yet, of course it’s not in the Apple Store. Thanks for pointing out the Crayon. And the Apple Pencil is $89 for students. Priced and packaged to sell. That is incredible and will get everybody into iPad. Is the iOS update today still? It’s cheaper than the lowest priced iPad mini 4! They mentioned enhanced sensors for AR support. Schools will soon begin requiring advanced AR support in their RFPs, and Apple has the only Tablet that supports it. Without it, the hardware is already dated, and not prepared for the future. This new iPad is $429 for the 32 Gb model in Canada, meaning it will probably be $399 for education. Not a good deal. But then, Apple has NEVER been a good deal, if all you look at is price. What is it replacing? The 9.7″ iPad Pro is now no longer available. It was an A9x with a 12 Mp camera; this is an A10 with an 8 Mp camera. That model was $729 in Canada. But you could also get a 9.7″ iPad, A9, 8 Mp for $379, which was the cheapest entry level iPad. But that too is now discontinued; so this new one is actually a more EXPENSIVE entry level model. Conclusion: Other than Pencil support, this is a more expensive entry level model that’s still too expensive.